This evening, fly aboard our selected scheduled airline from New York JFK to Reykjavik, Iceland. Arrive early morning in Reykjavik. You will be welcomed and assisted by your local English-speaking guide and transferred to Blue Lagoon. Enjoy a peaceful time at the Blue Lagoon, an incredible geothermal spa in Iceland, set in an otherworldly area where lava and thermal water meet. The lagoon’s warm geothermal water and natural active ingredients; mineral salts, silica and blue green algae help you relax and unwind while the lagoon’s distinctive white silica mud gently cleanses and exfoliates the skin. The mineral salts balance and relax body and soul. After enjoying all the amenities, shower and dip in the Blue Lagoon, enjoy an express breakfast at the restaurant and later your coach will take you back to Reykjavik. Arrive at the hotel and check in the hotel. After breakfast, enjoy the tour of Reykjavik. Reykjavík- located on the coast of Iceland, is the country's capital and largest city. It's home to the National and Saga museums, tracing Iceland’s Viking history. There is never a dull moment in Reykjavik. Visit the small European capital visiting its harbor, the world’s oldest parliament, the towering church Hallgrímskirkja the Tjorn - the pond in the middle of town, town of Hafnafjordur. Overnight at the hotel. After breakfast, explore the famous Golden Circle, including the historical UNESCO-listed site of Thingvellir National Park, where Iceland’s first parliament was founded in 930 AD. 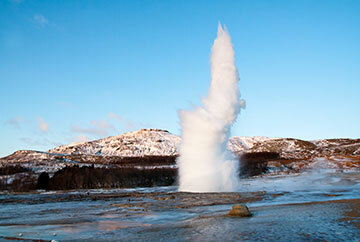 Next, visit Geysir hot springs and magnificent Gullfoss waterfall, and continue to the beautiful south coast. Overnight at your hotel in Reykjavik. After breakfast, discover the wonders of Iceland’s southern coast as you drive to Seljalandsfoss and Skogafoss waterfalls and Reynisfjara, a black-sand beach. First stop at Seljalandsfoss waterfall, Iceland’s famous waterfall, which you can actually walk behind. Second visit the infamous Eyjafjallajökull volcano which erupted in 2010 caused all the flights to cancel flying for one week in all the European cities. At Skogafoss waterfall, if you are lucky, you will see a rainbow appear in the spray. The third stop is black beach of Reynisfjara. Famous Bollywood and Hollywood movies are shot here to film this beach. Also visit the small peninsula of Dyrhólaey, known for its lighthouse, and afterward in Vík, the southernmost village in Iceland, with a church on the hill. Return to your hotel in the evening. After breakfast, enjoy the whale watching from the Old Harbour in downtown Reykjavík. First enjoy a ride to the islands and see the puffins (season 15 May - 15 August) in their natural habitats. 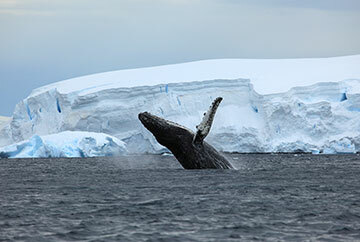 After seeing the puffins, continue your sailing in the search of the whales and dolphins for a lifetime experience. Return to your harbor in Reykjavik and then to your hotel. After breakfast, drive to unique Kleifarvatn Lake through Hafnarfjörður across the lava field in the middle of the peninsula. Continue to the geothermal area of Seltún,with its colors, geothermal smoke, and boiling mud. Later visit the Krísuvíkurberg cliffs after stopping at two volcanic craters — an explosion crater named Grænavatn (Green Lake) and the more impressive Eldborg (Fire hill). The infinitive struggle between the Fire and Ice truly justifies the struggle between volcano and the ocean – thus this country is called the country of Fire and Ice. We take an hour’s break at a restaurant for lunch, an excellent time to go over the history of the towns on the Reykjanes Peninsula, both as fishing towns and for their part in modern day Iceland. Return to your hotel. After breakfast, check out and transfer to airport for flight to New York with happy memories of Iceland. Note : Supplement additional cost if you are not sharing the room will be $ 885. 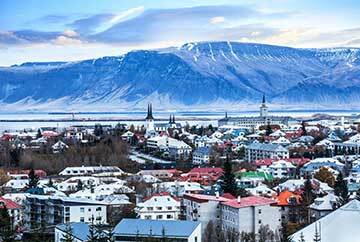 Airfare from New York to Reykjavik, Iceland roundtrip in coach class on our selected scheduled airline. First class hotel accommodation as per the program based on sharing a twin/double standard room. All transfers, sightseeing and excursion tours by private air-conditioned motor coach. Buffet breakfast at the Hotel/local restaurant. Visit to the Blue Lagoon. All dinners at local restaurants/hotel buffet/fixed menu basis. Services of experience English speaking guide. Entrance fee to the places of visit. Please read all the terms and conditions carefully before filling in the Tour Booking form and mailing your deposits. Please make the check payable Pollina Tours and Travel, Inc.
Visa fee, any airport taxes/surcharges levied by the airline, meals not mentioned above, Travel Insurance, porterage, airport taxes, mineral water, alcohol, items of personal nature such as laundry, telephone, room service, any increase of airfare or government-imposed taxes, any airport taxes/surcharges levied by the airline at the time of ticketing, any other items not mentioned in the tour inclusion list. Pollina Tours do not sell any travel insurance. We strongly recommend that you obtain a comprehensive Travel Insurance coverage, including but not limited to trip cancellation, delay, loss of deposit, medical expenses, personal accidents and death, loss of baggage, personal belongings. “Cancel for Any Reason” travel insurance policy is one option that you must discuss with your Travel Insurance Company, as it offers a wider range of coverage if you cancel for any reason. Most Travel Insurance companies want you to buy insurance at the time of making your initial tour deposit to obtain the best coverage. Please contact and discuss all options available to you from the Travel Insurance companies of your choice before signing up on the tour. Once booked, the Tour involves a cancellation penalty if it is cancelled by you for any reason or for any circumstances beyond the control of Pollina Tours & Travel, Inc or its agents, and its service providers. We highly recommend purchasing Travel Insurance policy from the travel insurance company of your choice, covering all eventualities including, but not limited to, trip delay, trip cancellation, medical evacuation, illness, disease, death, accident etc. that can protect yourself from cancellation penalties, in case the tour is cancelled by you or due to circumstances beyond the control of Pollina Tours, or its agents/ service providers. An administrative fee of US $ 500.00 per person will be charged for any cancellation once the tour is booked. A 25% cancellation fee on total tour cost will be charged if the bookings are cancelled between 89-60 days prior to departure. A 50% cancellation fee on total tour cost will be charged if the bookings are cancelled between 59-30 days prior to departure. A 75% cancellation fee on total tour cost will be charged if the bookings are cancelled between 29-03 days prior to departure. For a later cancellation, or for any unutilized services, no refund will be permissible. It is mandatory for passenger to make all cancellations in writing, stating the reason for cancellation and same must be received in our office on a prompt basis. Most refunds generally take 6-8 weeks to process. It is the sole responsibility of each passenger/tourist to obtain and verify that all of their travel documents, such as passport, visa, and airline tickets, vaccination requirements, etc. are in order and meets the guidelines to embark on the trip. For information about outbreaks of infectious diseases abroad, please consult the World Health Organization’s (WHO) web site. All passengers are personally responsible to ensure that they are medically fit to travel. POLLINA TOURS make the booking with the Group Department of the airline, which means all the group members must travel together to and from a common gateway, as one Group. The Group tickets are lower fare tickets and carry restrictions. The tickets are nonrefundable, non-transferrable, non–re-routable, and non-endorsable. Policies governing seat assignments for groups vary greatly by airline. Most airlines currently offer preferred seating, a system which allows them to charge additional fees for more desirable seats, which may include window and aisle seats. As a result, many seats displayed on airline seat maps are set aside for clients willing to pay additional fees for them. Some seats may only be accessible at airport check-in, although sometimes passengers with frequent flyer status may have earlier access. Seat assignments preferences are not guaranteed by Pollina Tours Loss of assignments may occur, at any time, due to airline schedule changes, or even as a result of individual passengers making changes directly with airlines on their group seat assignments. In many cases, airlines will not assign seats for groups until approximately 30 days prior. At this time, Pollina Tours will do all possible to seat passengers together and in the best available seats. However, it may not be possible for Pollina Tours to assign seats of each passenger's individual choice. Once assigned, typically seats may only be changed at airport check-in. Domestic US flights, as well as flights within Europe, do not permit group seat assignments. An exact passport name is required to complete seat assignments. Subsequent name corrections may result in the loss of seat assignments, in addition to other fees. Some airlines reserve the right to refuse subsequent seat changes, once preliminary seat assignments have been completed. Airline reservation agents are often prohibited from assisting with seat requests for group reservations. Pollina Tours & Travel, Inc, and/or their agents give notice that all tickets, vouchers and the coupons issued by them and all arrangements for transportation or for conveyance/hotel accommodation, sightseeing, excursions, etc., made by them, as AGENTS of the passenger upon the express condition that they shall not be held liable for any injury, damage, loss , accident, death, delay or irregularity which may be occasioned either by reason or defect of any vehicle, or through the act or default of any person or company engaged in conveying or housing the passengers or in connection therewith, or of any hotel proprietor or employee. Pollina Tour, and/ or their agents can accept no responsibility for cancellation penalties or losses or incidental expenses due to delay or change in schedules of airline, rail, motor coach, cruise or any transportation companies etc., hotel overbooking or default, sickness, injury, death, weather, strike, political or social unrest, disease, epidemic, pandemic, terrorism, natural calamities, quarantine or any other causes beyond the control of Pollina Tours & Travel, , its agents and suppliers of services. All such losses or incidental expenses will have to be borne by the passengers. Baggage is at owner’s risk throughout the tour. Obtaining a suitable travel insurance policy to cover the medical and non-medical eventualities from any Travel Insurance company of your choice is solely the responsibility of each passenger/tourist booked on our tour. Pollina Tours & Travel reserves the right to accept or reject any person as tour participants, to expel any tour participants from the tour, to make changes in the itinerary whenever the company deems it is necessary for the comfort, safety and convenience of the participants or their agents/service providers. Although, all safety measures are taken by our suppliers to ensure you have an enjoyable and safe tour. However, our Service provider will require you to sign their responsibility form to not hold them responsible for any injury, accident, death, etc., caused to you during any adventure tourism activities, jungle safari, etc. which is beyond their control. All prices are quoted in US Dollars. The transportation, airlines, rail, cruise, ferry companies, etc., concerned are not to be held responsible for any act, omission, or events during the time passengers are not on board their carriers and conveyance. The passenger’s contract in use by the airline carrier, when issued, shall constitute the sole contract between the transportation company and the purchaser of the Tour(s) and/or passengers. Typically, check- in time at the hotels is 3:00 PM and check out time is 12 noon. Sequence of the itinerary is subject to change, due to circumstances beyond our control.